Girl football clothes are the perfect way to get your little princess ready for game season. From NFL apparel to your local high school team, girls can cheer on your favorite athletes right alongside the boys. There are many reasons to purchase girl football clothes. For novelty, it may be time to start shopping while your girl is still in utero, especially if you are diehard fans of a specific team. Or, the need for football apparel may come later in life when an older sibling has gone out for the football team and you are planning to all be in the stands to cheer him on. Finally, sometimes a girl needs actual football uniform pieces and equipment if she chooses to join the team herself! Whatever the reason, chances are the perfect football outfit is out there. Many football clothes sold for little girls include a touch of femininity that make them fan favorites as they master that perfect combination of team spirit and adorableness. Sometimes this means a favorite team insignia is found on a pink shirt, such as this one sold at Sport Fanatic. It can also come in the form of a comfortable onesie along with a baseball hat perfectly suited for time spent outdoors cheering on the players. However, there are plenty of non-pink items available for football fans who also happen to be young and female. Through the NFL's official webstore, you can custom order a variety of team apparel, as well as purchasing miniature jerseys to match her favorite player. You can also purchase something a bit more novel, such as a cheer jumper that can be worn to any game or Super bowl party. Making your own football clothes is simple. Since we live in an era where anyone can screen print at home, you can print out graphics of your favorite team or purchase iron on patches through an official fan shop. You can even get plain white T-shirts and use fabric paint in your favorite team colors to write out the name and jersey number of your favorite player. You can also make girl-specific items such as a pleated skirt in team colors, a windbreaker or leather jacket with embroidery and miscellaneous embellishments, or fun accessories such as socks, hair decorations or jewelry. If your daughter is brave, bold and joining the boys out on field, she will need football clothes that go beyond fan wear. This is the real deal, and you will be borrowing or purchasing padding and official uniform equipment that will be available through your school or team headquarters. What's next is buying practice gear and workout clothes. She can look official year round in a personalized jersey, while exercise apparel can be found at stores like Danskin, which specializes in workout wear for both girls and women. Finally, you can purchase sweats and other comfortable, movement friendly items at local department stores and specialty shops that sell girls clothing. Be sure to check with your daughter's coach to find out what exactly is expected and/or allowed at team work outs and practices. 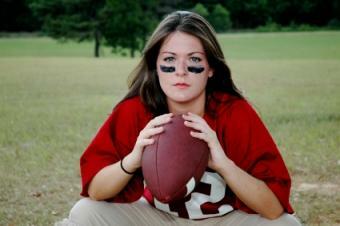 Girl football clothes are fun for kids to wear, whether they choose to be on the team or simply cheer from the stands. Consider thinking up a special gift for the little girl in your life based upon these ideas, or your own inspiration that comes from watching her love of the sport firsthand.